Please know that while some of this post contains content for upper elementary teachers, the information about Student Data Tracking Binders and Assessments is for grades 2 through 6. I’ve been getting a lot of questions lately about implementing my Student Data Tracking Binders and my Standards Based Assessments mid-year. A lot of people are concerned that if they didn’t start them at the beginning of the year, that they can’t start them at all. I’m here to show you that this IS NOT TRUE! You can start them ANY time of the year. The most important thing to remember is that your students will probably not be able to do all of these steps you are about to read overnight. It takes time. You have to “train” them in order to get them to follow these steps, and as you will read, be able to implement them in about 15 minutes flat. 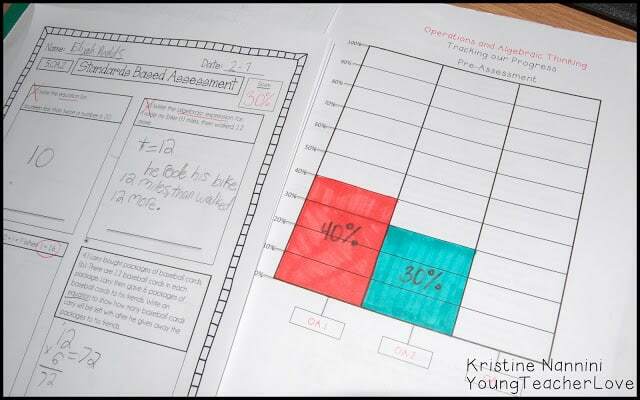 We started our intro to algebra unit this week, and I want to show you how I use the Student Data Tracking Binders mid-year. We started the unit by taking our algebra pre-assessments. Students took about 15 minutes to finish, and I checked them during their specials. I immediately handed their pre-assessments back to them so they could see how they did, and graph their results in their Student Data Tracking Binders. Since this is the first year my 5th graders have been exposed to algebraic equations and variables, I expected pre-assessement scores to be low. Not a problem! This just further helps me to see where I need to focus my instruction this unit. Because I took the time to break each standard down with the teaching notes in my Standards Based Assessments, I don’t have to waste a ton of time planning. Since I have these teaching notes all organized in my lesson plan binder, a quick glance helps me see what a standard really is all about, and what my students need to master by the end of this unit. See more about the teaching notes HERE. Students typically take about 3-5 minutes to check out their assessments and record their scores in their Student Data Tracking Binders. We then go directly to our “I can” statement posters on the wall to see where we are heading in this unit. This involves a simple say and repeat, and maybe a quick explanation by me. Nothing fancy. Students then write the “I can” statements and their pre-assessment scores in their Student Data Tracking Binders (2 minutes max). These posters can also be found HERE. Since these math concepts are so new to my students, and because a lot of the vocabulary is foreign to them, we went a step further (for the first time) and broke the “kid language” statements down even FURTHER in our student math notebooks. I knew my students needed this when I was reading the statements and the looks on their faces were scary. This honestly was the first unit we have experienced this, and I know it’s because of the lack of prior knowledge with algebra. This mini-lesson took about 8 minutes. 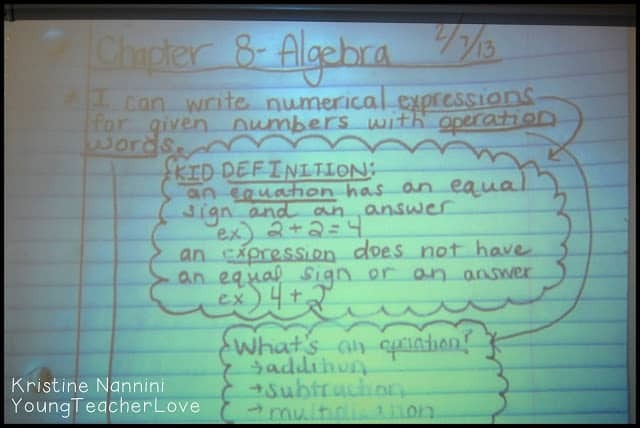 Once we delved into this quick mini-lesson on the vocabulary of the unit (algebraic expression, equations, variables, etc.) we then went to our “Rate It/Date It” section of our Student Data Tracking Binders. I have our Marzano inspired posters hanging on our data wall for students to refer back to. I simply call out for students to rate their understanding/learning of the “I can” statement at this point and students hold up their fingers. I appreciate their honesty and they know the importance of rating themselves honestly. Students then go right to their Student Data Tracking Binders and write down the data and their current level of understanding under the “Rate It/Date It” section. You can see the current concept we are on is the 3rd statement from the top. The top statements went through this same process, and we finished the standard with post assessments at the end of the unit. The above process of “Rate It/Date It” takes no more than 3 minutes. So, in total from the beginning, about 18 minutes. Not too shabby! Now that we have set ourselves up for the unit, I have the rest of my math block to TEACH and break my kids up into groups to provide any intervention and guided group instruction that they need. For those not interested in reading about the lesson below, know that the next step of the Student Data Tracking Binders includes my teaching, and a few more opportunities for students to rate their levels of understanding. Then, at the completion of the unit, we take the post-assessment, and students repeat the beginning steps of graphing their scores. 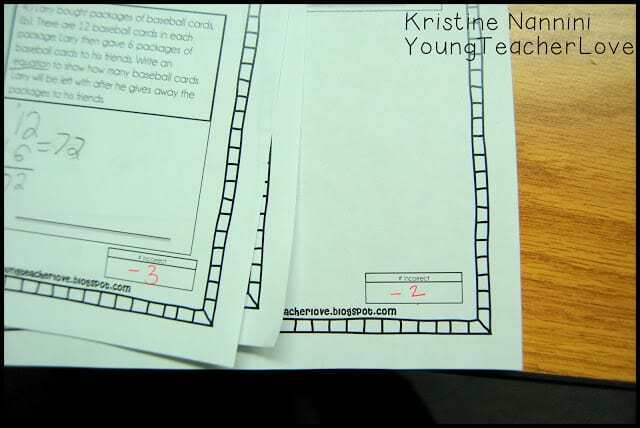 See more about my Student Data Tracking Binders HERE. 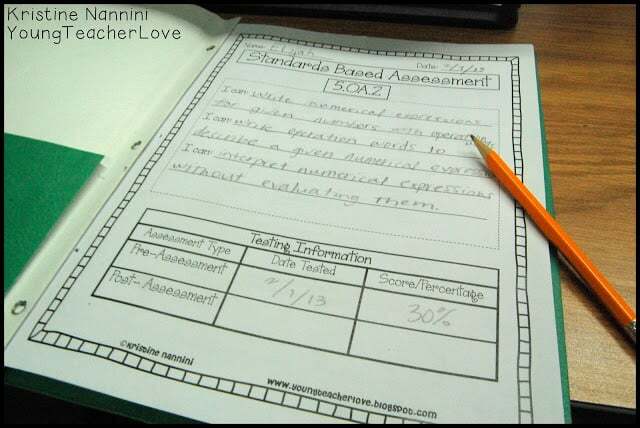 The process of graphing their scores, the organization of the standards in a checklist format, as well as students seeing their level of understanding increase throughout a unit is profound. Research shows that when students are responsible for tracking their own learning/understanding and data, they perform much higher on high-stakes tests, and they show higher levels of intrinsic motivation at school (I have definitely experienced this firsthand in my room). 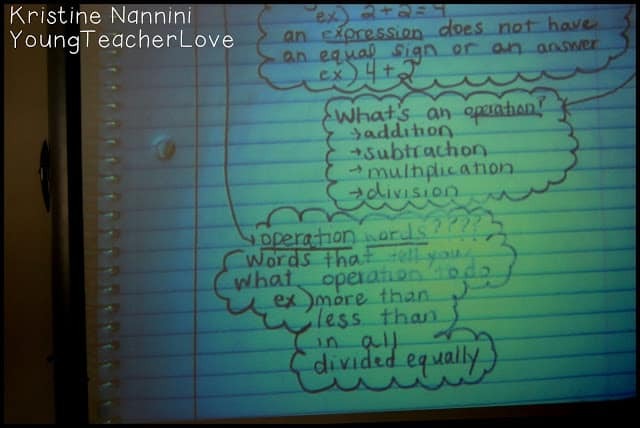 The first lesson we tackled, focused on writing algebraic expressions using operation words. We had a lesson at the beginning of the year on operation words, but I brought this back out as a refresher. 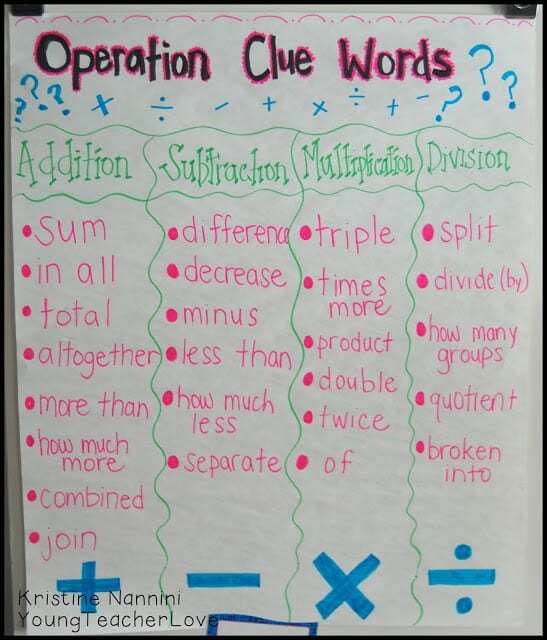 My students need a strong foundation with these operation words in order to write algebraic expressions from sentences like 5 more than twice a number x! After we completed the word sort, we created this anchor chart of Operation Clue Words together. As our learning activities continue, we will progress through the unit spending a few days on each of the standards. At the end of the unit, my students will take their post-assessments and graph their results, and finally check off the standards they have mastered in their Student Data Tracking Binders. This process has been such a blessing with my kids in both math and English Language Arts. They actually LOVE this process and LOVE being in charge of their learning and data tracking. Many of them tell me for the first time that they actually “get it” and see how all of the learning standards are connected. Their self esteems have gone through the roof because of this! Read more about data binders HERE! You never cease to amaze me Kristine! I’m thinking this would be the perfect year to start these with the group I have. I’m glad to know I can start them mid-year. You’re too kind Kristen! Thank YOU! I can’t say enough about these! I know I blog about these data binders a lot, but they really are what my whole classroom is revolving around this year! Wow! I just found your blog and I love it! I am an intervention teacher and I am thinking how valuable these would be to have for all my groups. Thank you for sharing! Thanks so much Amy! You’re too sweet! I’m glad you found some things you can use! This is great Kristine! Even though I have second graders some of these activities would be great for them as well. so super happy i found this!! I just graduated with my degree.. not teaching yet, but great to gain ideas!! Wonderful! Congratulations on graduating!! Thanks so much for your comments! I am enthralled by all of this data collection tools that you have created! I’m trying to envision how it’s going to all work out for my class this year. As far as procedural goes…it appears that you have the data worksheets in a two pocket folder? Do you put all of the standards in the folder at the beginning of the year or distribute the standards as you get to them? Do you find that students are pretty honest with the “rate it” system? @Joy-Thanks! Have you had the chance to check out my free Frequently Asked Questions pack? 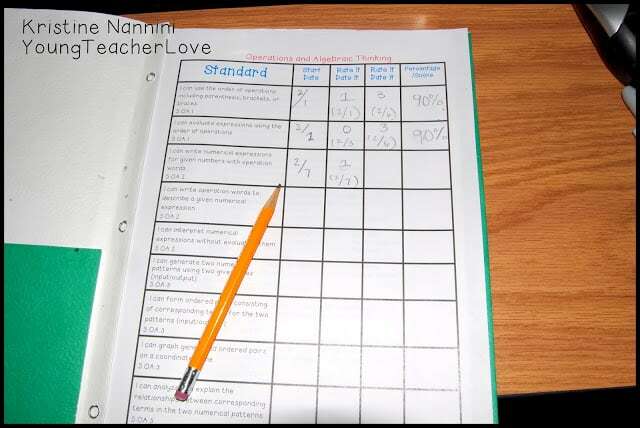 It may help a bit and is found here: http://www.teacherspayteachers.com/Product/Miss-Nanninis-Data-Binders-and-Assessments-FAQ-482328. You’d be surprised, students are SUPER honest in rating themselves. I do a lot of modeling at the beginning though, and we have many conversations about the point of being honest. If you’re not, not only will it show in your scores, but you will end up in a group you don’t belong in. It helps to have a super trusting environment for your kids as well. That way they feel confident being truthful about not understanding certain concepts in front of their peers. I love your materials, and am wondering what your long-term planning looks like for math. 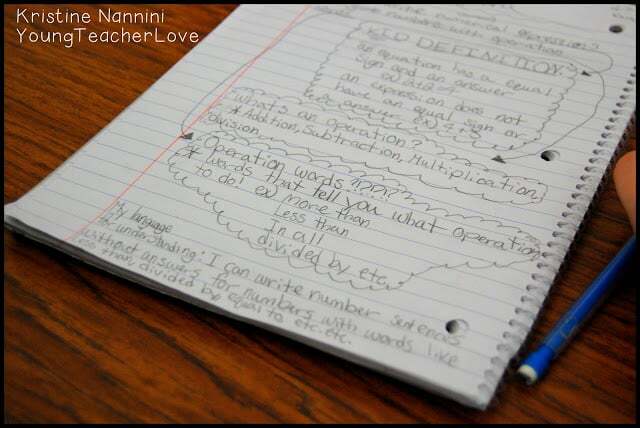 Do you have a curriculum in your building, or do you just go straight through your notebooks? If you just use your notebook, how do you decide how long to spend on each skill? Hi Merideth- Thanks so much for your question, and your kind words! 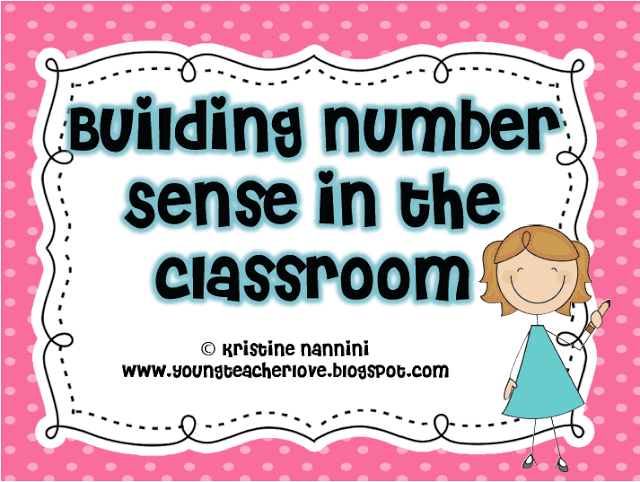 Here is the link to my free Frequently Asked Questions Pack: http://www.teacherspayteachers.com/Product/Miss-Nanninis-Data-Binders-and-Assessments-FAQ-482328. In it I answer questions like this, and much more! I hope it helps! Take care! Your work is absolutely amazing! It makes me want to go back into teaching! I am simply in awe! Aw! Thank you so much Andrea! That means so much! I an in awe of your work! Can you please give me more details on how you correct student pretest. I usually circle the correct answer… But then students would know the answer for next time. Do you think students improve the next time because they remember what the answer isn’t? Thanks for your hard work and time! @April- I do not think that circling the correct answer will change any of the data from pre-assessment to post-assessment. I have never had a student “remember” or “memorize” an answer from pre-assessment to post-assessment. Have you had the chance to check out my free Frequently Asked Questions pack in my store? 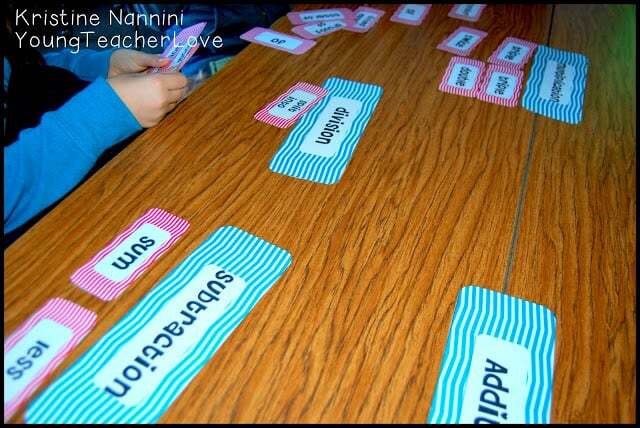 Here is the link: http://www.teacherspayteachers.com/Product/Miss-Nanninis-Data-Binders-and-Assessments-FAQ-482328. I answer this question and many more in this freebie! If you need more help, don’t hesitate to email me at nannini.kristine@yahoo.com. Thank you! I’m just starting a data tracking wall this year and I’m looking for the “I can” posters to utilize for each one of the standards. I tried finding them on TPT, but couldn’t I was wondering if you could point me in the right direction. 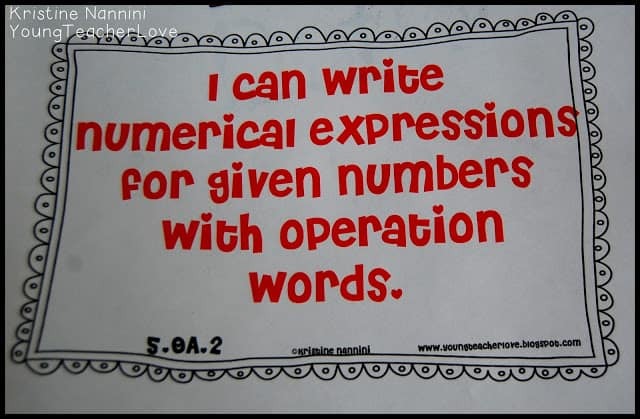 Hi Lorie- Here is the link to my “I can/We can” Statement Posters: https://www.teacherspayteachers.com/Store/Kristine-Nannini/Category/I-Can-We-Can-Posters. Enjoy! I am a 3rd grade teacher in Texas. I noticed these are are common core standards. How hard would it be to adapt them to our TEKS, since we are not common core? I love what I see! Hi Dianne- Thanks for your kind words! While this product is not editable, there are a number of Texas teachers who have purchased this and used it successfully in their classrooms. 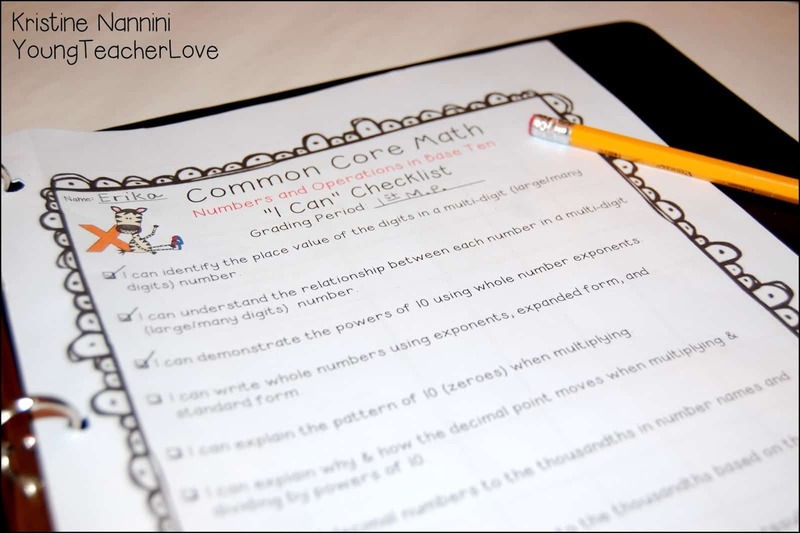 If you go to the website corestandards.org, you can see the Common Core standards, and there are also a number of websites that compare the two sets of standards. I hope that helps! Do you have the super hero levels chart available anymore? Hi Christie- Thanks so much! 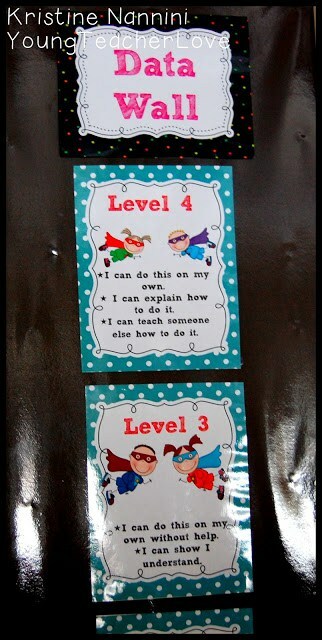 Here is the link to my Super Hero posters and rubrics: https://www.teacherspayteachers.com/Product/Levels-of-Understanding-Assess-Yourself-Rubrics-and-Posters-Super-Hero-Kids-281131.